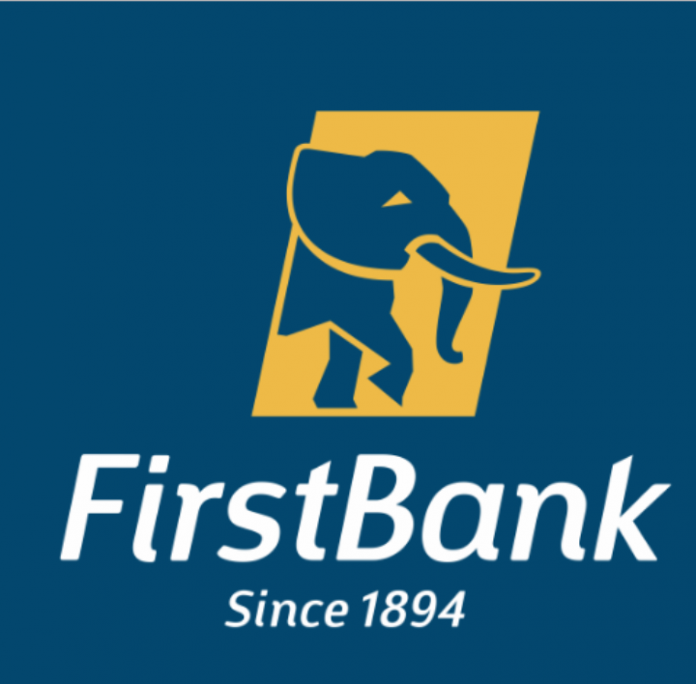 A dispatch rider at Institutional Banking Group (IBG), a department of First Bank, Iganmu branch working as a contract staff from Sandy Management Consultants LTD may have found himself between the devil and the deep blue sea as he cries out for his dear life after realizing that he might be used as a scapegoat in a case of insider fraud involving workers of the Elephant bank known overtime for their dubious, and nefarious activities. According to Humphrey Darlington Omeli, a Dispatch rider who hails from Ezeagu Local Government Area in Enugu State, who formerly resides at 2 Anjorin Close, Market, Okokomiako, Ojo Lagos State, he resumed work as usual on the 25th of September 2013 at about 8:00 am, while he was still having his breakfast with piles of document from previous day’s work waiting to be dispatched, the relationship Manager in-charge of a customer account known as “Olam Nigeria Limited” Mr Abimbola Jaiyesime summoned him with instruction to quickly dispatch some documents as top priority while he went on to entertain one Mr Mike, A staff of Olam Nigeria Limited that same morning. 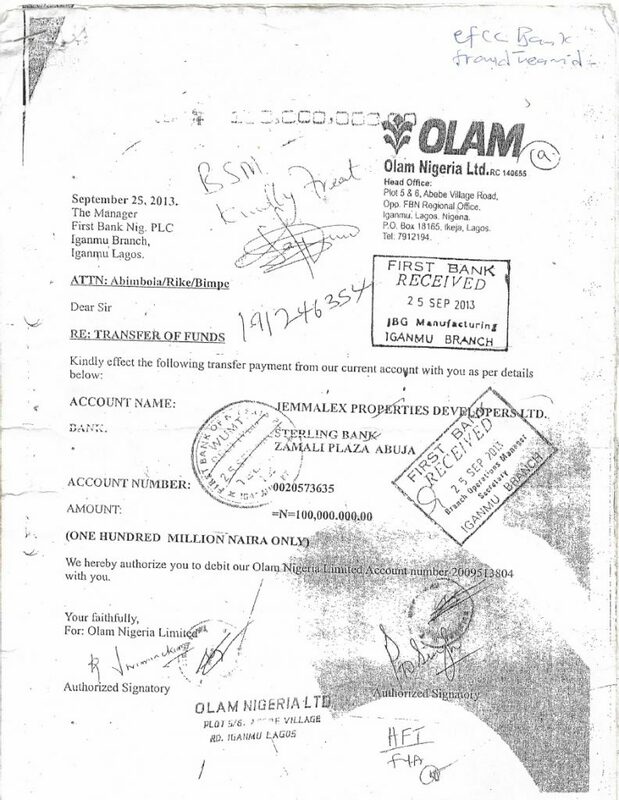 SecretReporters learned that amongst the documents from the professional criminals to be dispatched by Humphrey were, a Risk Assessment document, a Bid document, and four (4) Fund Transfer Instruction forms which originated from Olam Nigeria Limited and endorsed with IBG department’s stamp, signed by Abimbola. 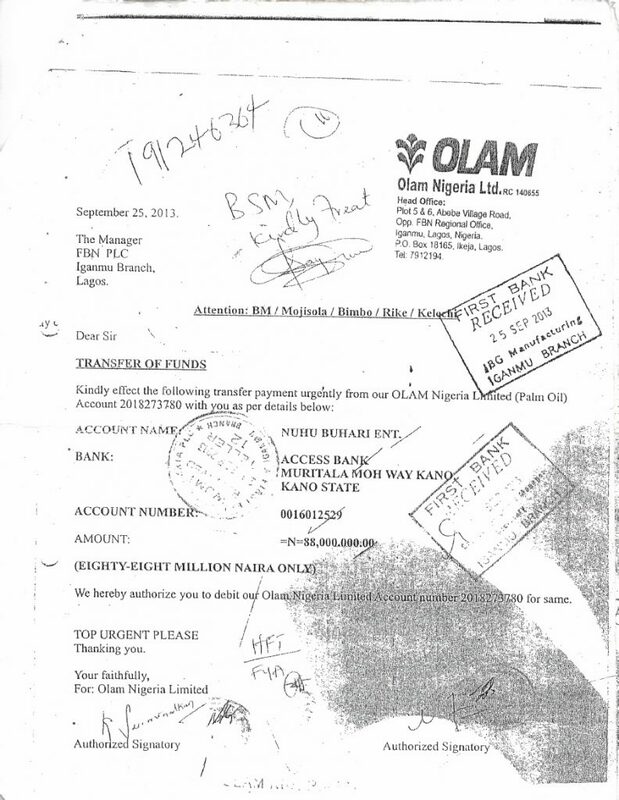 The four (4) forms which were minuted to the Operations Manager to treat we learnt were for the transfer of N355 million Naira to four different corporate accounts and had official signatures properly executed on each of the transfers with the company’s original letter headed papers. 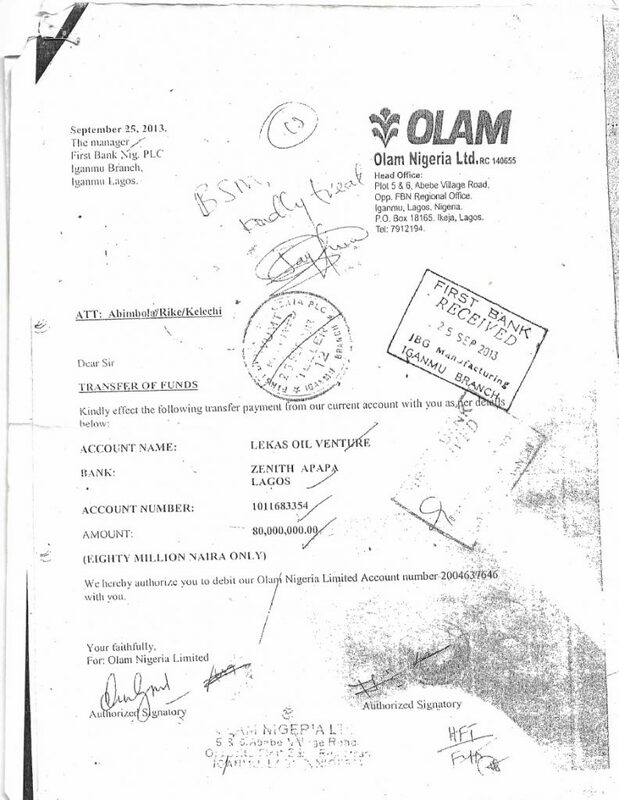 In line with procedures, Humphrey made photocopies of all the documents and submitted same to the operations secretary who in turn acknowledged receipt before he set out to dispatch the original documents to its various destinations which included, the head office Marina, Flourmills Apapa, Golden Sugar Tincan First gate, 7up Bottling company Ijora, and finally NBC Iddo when he was quickly called and summoned back to the office by the duo of Abimbola and Mrs Kelechi Ogbueyi who contacted him in quick succession via his mobile phone. A return to the office at about 2:50 pm saw him been quizzed by Mrs Kelechi on how he came across the dispatch forms, subsequently he was directed to report at the IBG head office where he had to wait till about 6.00pm after he was informed by the secretary, Mrs Felicia that the management was engrossed in a meeting. To his uttermost surprise, Mr Abimbola emerged from the IBG board room and whisked him aside while flooding him with questions concerning the transfer forms. 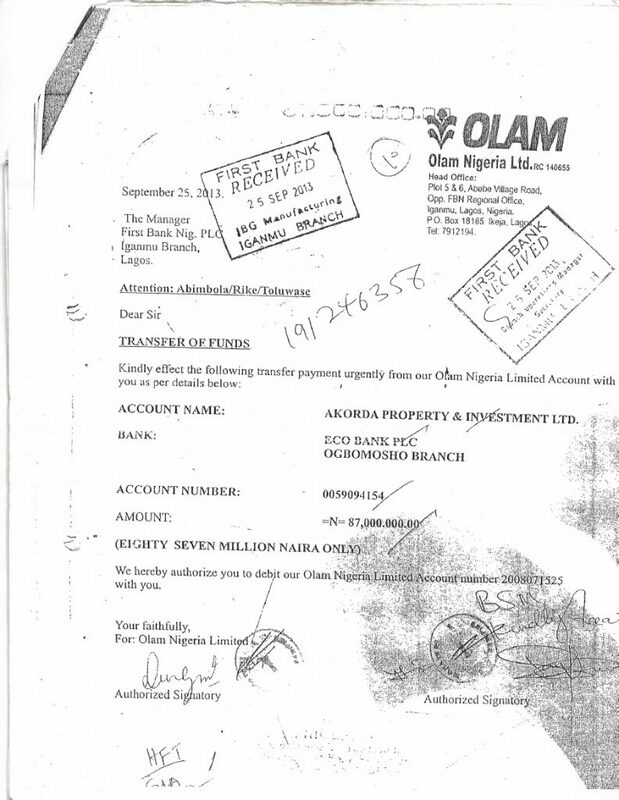 Mr Abimbola also instructed him to admit submitting the four (4) Fund Transfer Forms in error if he was to be questioned about it by anyone. A demand for an explanation met brick walls as he was told not to ask any question but “Just admit submitting the forms in error and all will be well”. Sensing danger and a possible attempt to conceal their nefarious act upon him, he insisted to explain the whole fact, an action which did not go down well with a visibly angry Abimbola. Mrs Mojisola also tried to persuade him to submit to Abimbola’s earlier instructions which he bluntly refused to do, with no questions as to his own side of the story from any ranking staff in the company he was asked to make a written statement at the security department, only then did he realize that a fraud of N355 million was perpetrated with the four (4) transfer forms. SecretReporters also learned that he was later smuggled downstairs by one of the security chiefs, Mr Abidemi and thereafter whisked away to the Lion building Police State where he spent the night over an allegation he allegedly knew nothing about.